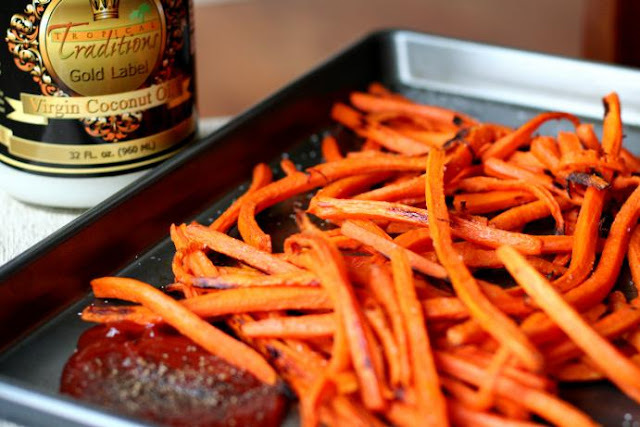 I love to use coconut oil to make carrot fries for one simple reason. I love coconut oil. Check out Tropical Traditions if you get a chance, because not only will this recipe and all of the 37 Cooks recipes be included on their website, there are more than 500 recipes already there! They claim that Tropical Traditions is America's source for coconut oil and I believe it. Since they became a sponsor of this group, our members have reported seeing their advertising everywhere! One member saw an ad on their local news in Huntsville, TX! carrots, peeled (optional), cut into equal sized "fries"
Put enough carrots on a rimmed baking sheet covered with parchment paper so there is a single layer of veg. You don't want to cook too many carrots on one pan or you'll steam them. We want to roast these carrots. Coconut oil solidifies at 76 degrees, so the chances are your coconut oil will be solid when you use it. I cook with gloves all the time, so I love to just dip my hand right in the jar, get about a tablespoon of oil and rub my hands together, which immediately turns the solid oil into liquid! It's fun! Then I rub my hands on the carrots and rearrange them so they are again in one layer. You can roast more than one pan of carrots at a time, just be sure to rotate the pans halfway through so they are evenly cooked. Cook for 18-20 minutes. If you didn't cut your carrots evenly, you will end up with some overdone ends. Some people like those, but I just clip them off the few fries that need it. Sprinkle with salt and serve with ketchup. We like a lot of pepper in our family so we've started to just put the pepper right in the ketchup!